Marcel Marceau Mined Mime's Deep Veins of Emotion Marcel Marceau, the French mime who was often described as bringing poetry to silence, died Saturday at age 84. 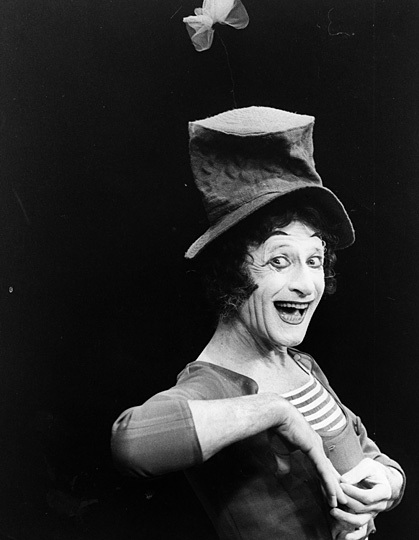 A tireless performer for more than half a century, Marceau repopularized the ancient art of pantomime for a modern age. Marcel Marceau, shown here performing in London in 1978, repopularized the ancient art of mime. He died Saturday at age 84. Marcel Marceau, the French mime who was often described as bringing poetry to silence, died Saturday at age 84. 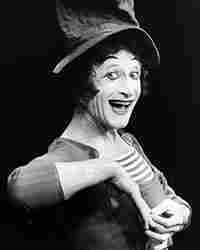 A tireless performer for more than half a century, Marceau repopularized the ancient art of pantomime for a modern age. Others have whitened their faces, blacked their lips and eyes, and leaned into a nonexistent wind. Others have plucked petals from invisible flowers, struggled to win a ropeless tug-of-war, and chased after butterflies only they can see. But no one has ever done this sort of clowning with more absolute belief than Marcel Marceau. His lithe and expressive body and his gestures — so liquid, his hands sometimes appeared to have no bones at all — are only part of it. The mechanics of his craft — the boiling down of gesture to its essence — can be learned. But not his ability to "mine" mime for the veins of emotion and pathos he found in it. Wistfulness, yes. Street mimes can manage that. But anguish, hope, innocence. These are harder. He packed them all into a single sketch he called "Youth, Maturity, Old Age and Death." I first saw him perform it in 1957, when my 2nd-grade class was taken to a show in a 3,000-seat auditorium filled with shrieking children. Almost miraculously, we all stopped shrieking as he took us on a journey from birth, through the playful childhood we knew, to an adulthood we didn't, and then to a sad, stooped frailty he pictured as a kind of second childhood. I saw him do that sketch many times through the years, finding more in it each time I saw it, most recently with my two young nephews. Marceau was 79 by this time, but he seemed, astonishingly, as limber as ever. My nephews laughed as he chased himself around a curtain as both David and Goliath. And laughed again as his character, Bip — inspired by Charlie Chaplin's little tramp — ice-skated and tamed lions. The Chaplin connection I had to explain, but the boys recognized another connection on their own — when Marceau, in his "Walking Against the Wind" sketch, slid backwards in a move Michael Jackson had borrowed and rechristened a "moonwalk." Marceau's influence extends further than that, of course — to theater and dance, and such hybrid forms as Cirque Du Soleil. These forms dress up pantomime with eerie lighting and music, allowing mere mortals to approximate what the master accomplished with little more than purity of gesture. On his first U.S. appearance in 1955, The New York Times called Marceau "a genius ... in a school of art that is not especially popular because only a genius really counts in it." As fans now mourn his passing — perhaps inevitably, with a moment of silence — it's worth noting that in the half-century after those words were written, Marcel Marceau brought this "not especially popular" art to literally millions around the globe.